As the Federation politically aspires to unite the whole of Bosnia, and abolish the entities, the tourism agency of the Federation  gives information about entire BiH, including the RS. On the other hand; the tourism organisation of the Republika Srpska , the entity which politically strives to uphold the inter-entity borders which were agreed in the 1995 Dayton-agreement, only gives information about Republika Srpska, and no information about the Federation of BiH. Bosnia and Herzegovina (Bosna i Hercegovina, Босна и Херцеговина, usually shortened to BiH)  is a European country located on the Balkan peninsula. It was formerly part of Yugoslavia but gained independence in 1992. It borders Croatia to the north, west and southwest, Serbia to the east and Montenegro to the southeast. 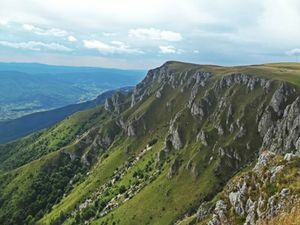 Mostly mountainous, it has access to a tiny portion of the Adriatic Sea coastline in the south. Until recently, the idea of a Bosnian-Herzegovinan nationality mainly applied to the nation's Muslims, also referred to as Bosniaks. Bosnia and Herzegovina's Croatians and Serbs looked to Serbia and Croatia for guidance and as the mother country and both had aspirations for political union with either Serbia or Croatia once the Yugoslav state began to fall apart in the early 1990s. This of course spelled disaster for the state of Bosnia-Herzegovina and as a result Bosnia and Herzegovina became a blood bath in 1992. Bosnia and Herzegovina was attacked by the Serbian-led Yugoslav National Army and insurgent Bosnian Serbs, and in 1993 Croatia with insurgent Bosnian Croat forces joined in the aggression. In the end the Croatian-Bosniak alliance fought the Serbian forces on the ground whilst NATO attacked the Bosnian Serbs from the air. A peace treaty followed with a heavy handled role of the U.S. Clinton Administration helping seal the deal in Dayton, Ohio. The result was that Bosnia would comprise of two entities and a District of Brcko. Things have rapidly improved since then but the two regions of Bosnia still have a long way to go towards complete political and social union. As of now, it could be said Bosnia-Herzegovina functions as one country with two or even three different parts. However, the central government lies in Sarajevo and there is one common currency, the Bosnian Mark (KM). Bosnia and Herzegovina's declaration of sovereignty in October 1991, was followed by a declaration of independence from the former Yugoslavia on 3 March 1992 after a national referendum. The Bosnia-Herzegovinan Serbs responded with armed resistance aimed at partitioning the republic along ethnic lines. In March 1994, Bosniaks and Croats reduced the number of warring factions from three to two by signing an agreement creating a joint Bosniak/Croat Federation of Bosnia and Herzegovina. On 21 November 1995, in Dayton, Ohio, the warring parties signed a peace agreement that brought to a halt the three bloody years of ethno-religious civil strife (the final agreement was signed in Paris on 14 December 1995). The Dayton Agreement retained Bosnia and Herzegovina's international boundaries and created a joint multi-ethnic and democratic government. This national government was charged with conducting foreign, economic, and fiscal policy. Also recognized was a second tier of government comprised of two entities roughly equal in size: the Bosniak/Croat Federation of Bosnia and Herzegovina and the Bosnia-Herzegovinan Serb-led Republika Srpska (RS). The Federation and RS governments were charged with overseeing internal functions. Bosnia and Herzegovina ranked next to Macedonia as the poorest republic in the old Yugoslav federation. Although agriculture is almost all in private hands, farms are small and inefficient, and the republic traditionally is a net importer of food. Industry has been greatly overstaffed, one reflection of the socialist economic structure of Yugoslavia. Tito had pushed the development of military industries in the republic with the result that Bosnia-Herzegovina hosted a large share of Yugoslavia's defense plants. The bitter inter ethnic warfare in Bosnia caused production to plummet by 80% from 1990 to 1995, unemployment to soar, and human misery to multiply. With an uneasy peace in place, output recovered in 1996-99 at high percentage rates from a low base; but output growth slowed in 2000 and 2001. GDP remains far below the 1990 level. Economic data are of limited use because, although both entities issue figures, national-level statistics are limited. Moreover, official data do not capture the large share of activity that occurs on the black market. The konvertibilna marka - the national currency introduced in 1998 - is now pegged to the euro, and the Central Bank of Bosnia and Herzegovina has dramatically increased its reserve holdings. Implementation of privatization, however, has been slow, and local entities only reluctantly support national-level institutions. Banking reform accelerated in 2001 as all the communist-era payments bureaus were shut down. The country receives substantial amounts of reconstruction assistance and humanitarian aid from the international community but will have to prepare for an era of declining assistance. Muslims and Christians are almost equally represented in Bosnia and Herzegovina. Saint Joseph's church in the Marijin dvor neighborhood in Sarajevo. Bosniaks (50.1% of the population), Serbs (30.78%), and Croats (15.43%) form the largest groups in the country. 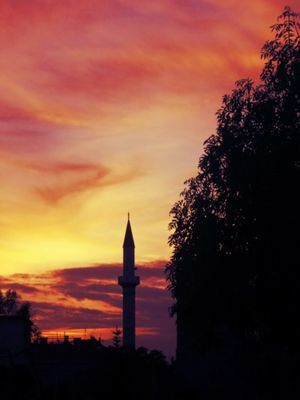 Since the break-up of Yugoslavia, Bosniak has replaced Muslim as an ethnic term in part to avoid confusion with the religious term Muslim — an adherent of Islam. Interestingly, the term Bosniak was used for all religions until the turn of the 20th Century, and then was abolished until 1992. Also note that ethnicity and religion mostly overlap; with Muslims (50.7% of the population, mostly Bosniaks and some minority groups), Orthodox Christians (30.75%, mostly Serbs), and Catholic Christians (15.19%, mostly Croats) being the three main faith groups of the country. There are also some Protestants and Jews as well. Nevertheless, the country is highly secular and religion is seen as more of a traditional and cultural identity than a set of rituals and rules. The three groups share the same south Slavic ethnic background. Vlachs were an important population of Herzegovina in ancient times. They were the heirs of Eastern Roman Empire. After slavicization in the IXth and the XIth centuries they were islamized under Turk occupation. Their heritage contains numerous necropolises with tombstones with petroglyphs at Radimlja, Boljuni, Gorica, etc. They do not have an organization to defend their heritage subjected to cultural appropriation. Mountains and hills around Sarajevo. Almost 50 % of Bosnia and Herzegovina is forested. 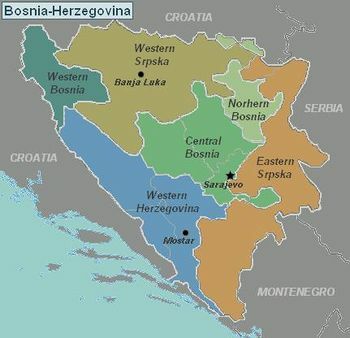 The country is politically divided into two "entities"; the Federation of Bosnia and Hercegovina with a predominant Bosniak/Bosnian croat majority population (about 51% of the territory) and the Republika Srpska (RS) with a Bosnian serb majority population (about 49% of the territory). On the map, you can see Bosnia and Hercegovina and how the entity of RS is divided into a western and eastern part. There's Federation BiH located in the West, North Bosnia, Central Bosnia, and Western Herzegovina. Sarajevo — the national capital; a cosmopolitan European city with a unique Eastern twist as can be seen in its vast diversity of architectural styles. Home for 400.000 people. Mostar — nice old town on Neretva River, symbolized by its medieval bridge. The biggest city in the region of Herzegovina (75.000 people). Looking at the Old Bridge from Old Town area of Mostar, Bosnia and Herzegovina. Kozara — national park in the northwest with dense forests and hilly meadows, a hiking and hunting destination. Međugorje — inland town between mountains with a mild Mediterranean climate, but perhaps best known due to claims of apparitions of the Virgin Mary to six locals. Počitelj very nice old village 30 km. South of Mostar on the way to and from the Adriatic coast. Zenica — city with an Ottoman old quarter. Home for 85.000 people in its urban area. Nationals of all European Union member states, Albania, Liechtenstein, Monaco, Montenegro, San Marino, Serbia and Switzerland may enter Bosnia and Herzegovina visa-free for up to 90 days within a six-month period with either a passport or a national identity card. Nationals of Andorra, Antigua and Barbuda, Argentina, Australia, Azerbaijan, Bahamas, Bahrain, Barbados, Brazil, Brunei, Canada, Chile, Costa Rica, El Salvador, Guatemala, Honduras, Hong Kong, Iceland, Israel, Japan, Kuwait, Macau, Macedonia, Malaysia, Mauritius, Mexico, Moldova, New Zealand, Nicaragua, Norway, Oman, Panama, Paraguay, Qatar, Saint Kitts and Nevis, Seychelles, Singapore, South Korea, Taiwan, Turkey, United Arab Emirates, United States, Uruguay, Vatican City and Venezuela, additionally persons holding British National (Overseas) passports may enter Bosnia and Herzegovina visa-free for up to 90 days within a six-month period with a valid passport. Nationals of Russia and Ukraine may enter Bosnia and Herzegovina visa-free for up to 90 days within a two-month period with a valid passport. Valid multiple entry visa holders and residents of the European Union, Schengen Area or Monaco can enter Bosnia and Herzegovina visa-free for a maximum stay of 15 days. However, they must arrive directly from a European Union or Schengen Area member state, Monaco, or a third country that has a bilateral readmission agreement with Bosnia and Herzegovina. This is not available for holders of passports issued in Kosovo. Any person not covered by one of the visa exemptions listed above will need to apply for a visa at an embassy or consulate of Bosnia and Herzegovina in advance. More information about visa exemptions and the visa application procedure is available at the website of the Ministry of Foreign Affairs . 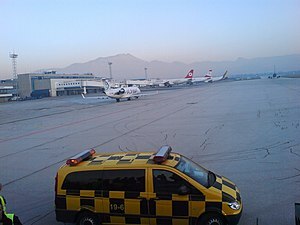 Sarajevo Airport  (IATA: SJJ) is in the suburb of Butmir and is relatively close to the city centre. There is no direct public transportation, and taxi fares to/from the airport are often more expensive than intended for the short distance. 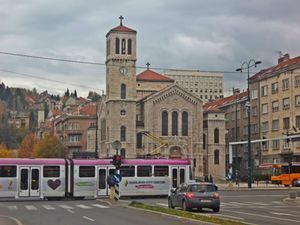 One option to save cash is to take a taxi to the tram terminus at Ilidža (ill-EEJ-ah) and board the tram for the last part of your journey, cost 1,80KM). Alternatively, call another taxi company than Sarajevo Taxi (which has a monopoly on the taxi ranks at the airport and 99% of the time will rip you off from the airport) to pick you up at the airport parking lot. Just wait by the entrance to the parking lot near the terminal and flag your taxi driver down when he approaches. The most popular taxi company that (almost) always uses the meter is Crveni (Red) Taxi - 033/760 600. The national carrier of Bosnia & Herzegovina, B&H Airlines, shut down in June 2015 due to unpaid debts to the Federation government. Croatia Airlines  connects Sarajevo via Zagreb at least twice daily, and from there connections are possible to Brussels, Frankfurt, London, Munich, Paris, Zurich and several other European cities. Air Serbia  connects Sarajevo daily via Belgrade, and from there one can connect with other international flights on Air Serbia and its partners to Frankfurt, Amsterdam and Rome, among others. For other services, check the Sarajevo Airport  website. Mostar , Tuzla  and Banja Luka  also have international airports, but with limited international services (Banja Luka only to Belgrade on Air Serbia, Mostar primarily to charter destinations in Italy). Tuzla International Airport was recently given hub status by Wizzair and now flies to several destinations in the Netherlands, Germany and Scandinavia. Note, however, that there are limited convenient transportation options between TZL and Sarajevo. Wizzair operates one shuttle service between the capital and the airport, often very late at night (11pm to 2am). Your best options are either to take a taxi to the bus station in Živince (jiv-ih-NEE-tse) and take the bus from there to Sarajevo or to take a taxi or shuttle service, if available, to Tuzla and stay overnight to catch the more frequent services to Sarajevo. Many travellers choose to fly into Serbia or Croatia, continuing travel by bus to BiH, on Zagreb, Split or Dubrovnik, the latter two being serviced by seasonal cheap tourist charter flights. Train services across the country are slowly improving once again, though speeds and frequencies are still low. Much of the rail infrastructure was damaged during the recent conflict, and lines have been opened on a priority basis, though not to the high level of service pre-war. The train services are operated by the two separate entities (based on the political division of the country), which results in the locomotives being changed rather often. Trains also operate from Sarajevo to Mostar. Services operate a few times daily by modern air-conditioned talgo trains which are relatively empty and provide possibly the most stunning rail journey in all of Bosnia! Be aware, the rail connection from Mostar to Ploče (Croatia) is no longer in service. On the other hand the rail connection Bihac-Banja Luka(-Sarajevo) was reestablished 2018 and even offers sleeping compartments. The direct train service between Budapest and Sarajevo ended in 2012. The direct train from Belgrade to Sarajevo is no longer in operation. Recent discussions, however, have taken place between the Serbian and Bosnian governments to improve and re-open passenger services between Belgrade and Sarajevo. WARNING: Be aware that due to the constant landmine threat it is better not to leave the paved road, even for a pee-break in areas where you are not familiar with; See #Stay safe(22 May 2015). This advisory should be updated since Bosnia and Herzegovina has already around 80 kilometeres of excellent highways and construction of new highways is in a full swing. 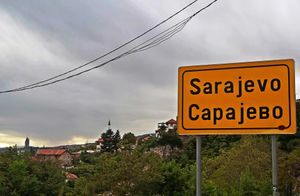 When finished, this highway will connect the northern part of Croatia with the coast as well as the new highway from Zagreb to Split, which eventually will extend to Dubrovnik. Also, main roads in the country (named "magistrale" in local languages) are normally in great conditions. If you leave main roads you might find problematic roads, but driving even there should not be a big problem. The only problem for foreigners can be aggressive drivers who do not show any respect for speed limits and other rules. Drive carefully and you will not face any problems. As of 2009, the main routes from the coast via Mostar to Sarajevo, and north from Sarajevo to the Croatian Border at Slavonski Brod/Slavonski Šamac, have been restored and are of excellent quality. By 2015, 100km of motorway has been opened, from Zenica-South to Tarčin, bypassing Sarajevo, and from the Croatian border at Bijača to Medjugorje. 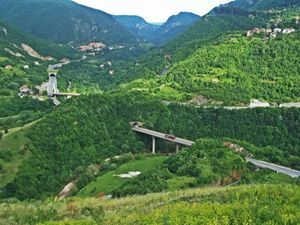 Three more sections are under construction, and the entire stretch of the European Vc corridor motorway in the Federation of Bosnia and Herzegovina is due to be completed by 2022. Most international buses arrive at the main Sarajevo bus station (autobuska stanica) which is located next to the railway station close to the centre of Sarajevo. However, buses from Belgrade, the Republika Srpska entity and Montenegro almost always use the Lukavica bus station in Istočno (Eastern) Sarajevo (the Serbian neighbourhood of the town). Note, however, that the "Eastern" bus station is actually west of the city center, near the international airport and the Dobrinja trolleybus terminus. Hitchhiking is fun in Bosnia as you will get rides from local people who you won't much encounter through hospitality exchange networks as couchsurfing. Be carefull though for landmines, and if you're not sure, stay on the paved road, and ask locals ("MI-ne?"). Latin and Cyrillic letters are both official in Bosnia and Herzegovina. The official languages in the Bosnia and Herzegovina are Bosnian, Serbian and Croatian. In the Republika Srpska you'll see signs in Cyrillic, so a Serbian-English dictionary would be helpful there. A lot of Bosnians, especially the younger generation will speak English. A surprising number of young people will also know at least some German, because Bosnian kids learn German at school. The older generations tended to have studied English, French or German in school. The Neretva river and its tributary the Trebižat, the Unac river, also the Krivaja river and its tributary Bioštica river are great kayaking destinations with a lot of whitewater on the Krivaja river. The Pliva river and its lakes Veliko and Malo (5km from Jajce) are great canoeing destinations, also the middle and lower Una river, the Trebižat river. Close to Sarajevo there are the Bjelasnica, with over 8km of ski trails, the Jahorina (20km) and Igman mountains. Close to Travnik is the Vlasic Mountain with 14km. Other resorts are Blidinje, Vlasenica  in the east and Kupres in Western Bosnia. Vlašić is the highest mountain in Central Bosnia. The official currency is the konvertibilna marka (convertible Mark), divided into 100 feninga. Originally pegged 1:1 to the Deutsche Mark, it is presently pegged to the Euro at roughly 1.95 to the euro (1 EUR = 1.95583 KM). Coins come in denominations of 5, 10, 20, and 50 feninga and 1, 2, and 5 marka with banknotes in 10 (orange), 20 (grey), 50 (red-violet), 100 (brown), and 200 (blue-green) marka. There are two sets of the KM10, KM20, KM50, and KM100 notes with distinct designs for the Federation and the Republic of Srpska; however, both sets are valid throughout the country. Before you leave the country, be sure to convert back any unused KM into something common (Euros, dollars) as most other countries will not exchange KM. Credit cards are not widely accepted - ATMs are available in the most cities (VISA and Maestro). Try to not pay with 100 KM bills, as smaller shops might not have enough change. Most towns and cities will have markets and fairs where any number of artisans, sellers, and dealers will offer any kind of stock. Different foods are readily available, both fresh and cooked, as well as clothing, jewellery and souvenirs. At the markets you are able to negotiate with the seller, although that may take some practice. Like in most such venues prices may be inflated for foreigners based on a quick 'means test' made by the seller. Often those who look like they can afford more will be asked to pay more. Large shopping centres you'll find in most cities and towns. Sarajevo is fine for buying clothes and shoes of cheap quality and relatively cheap price. The main shopping streets of Sarajevo are also great for black market products including the latest DVDs, video games and music CDs. Most tourists who visit Sarajevo no doubt leave with a few DVDs to take back home. Banjaluka has seven big shopping malls, as well many small businesses, and you will be able to find a large variety of goods. If you have a temporal (tourist) residency status and you buy goods worth more than 100 KM you are entitled to a PDV (VAT) tax refund. PDV consist of 17% of the purchase price. The refund applies to all goods bought within three months before leaving, except petroleum, alcohol or tobacco. At the shop, ask the staff for a tax-refund form (PDV-SL-2). Have it filled out and have stamped (you need your identity card/passport). Upon leaving BiH, the Bosnian customs can verify (stamp) the form if you show them the goods you bought. A PDV refund in Marks can be obtained within three months, either at the same shop where you bought the goods (in that case the tax will be refunded to you immediately), or by posting the verified receipt back to the shop, together with the account number into which the refund should be paid. The most available food in Sarajevo is Cevapi (normally 3-7 KM), the ubiquitous Balkan kebab. Two prominent variations exist - the "Banja Luka" Cevap, a larger kebab with a square shape, and the Sarajevo Cevap, smaller and round. If not had before, every visitor should try an order of Cevapi at least once. There are several variations of pita (around 2KM). A cheap, tasty and readily available snack is "Burek", a pastry made of filo dough and stuffed with meat (simply Burek), cheese (Sirnica), spinach (Zeljanica), potatoes (Krompirusa) or apple (Jabukovaca). Some examples are better than others, however, and it can be a greasy affair. If you get to Mostar, however, try to grab a plate of trout ("pastrmka," which sounds like "pastrami"), which is the local specialty (a particularly fine restaurant serving locally farmed trout lies by the wonderful Blagaj monastery, a short bus ride from Mostar). Local food is heavy on meat and fish, and light on vegetarian alternatives. Even traditional so-called vegetarian dishes like beans or Grah are cooked with bacon or smoked meats. Stews often contain meat but can be created without. Rice and pasta dishes are readily available and a traditional sourdough soup filling called Trahana is hand made in most regions and a staple during the fasting month of Ramadan. Fast food, with the exceptions of cevapi and pita (or burek) consists of, like in other parts of Europe, pizza, hamburgers and hot dogs. Panini sandwiches are served in most coffee shops popular with the youth, and Bosnian coffee, reminiscent of Turkish coffee, is a must-try for any coffee aficionado. Oddly, apart from these fast food options, Bosnian restaurants serve few Bosnian specialities - what people eat in their homes is very different from what they will eat if they go to a restaurant. No matter what food you order, you are bound to be served bread, commonly consumed throughout some parts of Europe with all savory foods. Both soup and salad are commonly served with entrees, chicken & beef soup with noodles or egg dumplings being the most common. Salads are typically composed of mixed tomatoes, lettuce, onions and bell peppers, often with feta cheese. A Caesar salad is unheard of in Bosnia, and generally most vinaigrettes are of the Italian variety, balsamic vinegar and olive or corn oil. You may also come across many condiments. Ajvar is a jarred (or home made if you are lucky) spread, vegetarian, something like a bruschetta spread, made of roasted peppers & eggplant, which are then ground and seasoned with pepper and salt, then slow-cooked. It's a staple of many Balkan countries, with the Macedonian varieties ("Biljana") being most popular and widely available. Many pickled foods are also served as condiments, such as pickled peppers, onions, cucumbers ["pickles"], and tomatoes. Kajmak is a dairy spread, with consistency and taste like cream cheese. It is made of milk fat, which is removed, salted and packed, usually in a jar. It has a smoky, salty cheese taste, with a texture slightly drier than cream cheese. Kajmak from the town of Travnik is a highly regarded local specialty which is also exported as far as Australia. Bosnian food generally does not combine sweet & savory foods, and you will never encounter such a thing as a salad with mandarin oranges. On the other hand, many a fine chef will experiment with sweet and savory tastes like the 'Medeno Meso' (Honey Meat) made in pre-war Banja Luka by a well known chef. The delineation between fruit and vegetables is strong, with fruit used only for dessert-type dishes. You will never encounter any dish where sugar is added unless it's a dessert. The food is generally heavy on fresh produce, which needs little or no added spice. As such, there are few spicy or hot dishes, and dishes advertised as "spicy", such as stews like paprikas or gulash are usually spiced with paprika and not chillies, and do not carry overt pungency. In some regions, and depending on whether it is restaurant or home food, textures and colors can be important also. Like in much of Europe, smoked meats are one of staples of Bosnian cuisine, more so even than the stereotypical foods of pita & cevapi. Amongst the non-Muslim populations pork is king, and prosciutto, smoked neck, smoked ribs, bacon, and hundreds of other varieties of smoked sausage make this a real BBQ and dry-cuts country. The Muslims, of course, have equally-tasty lamb or beef alternatives. The meat is prepared by first curing in salt for several days, which removes water & dehydrates the meat, while the high-concentrations of salt preserve the meat from spoiling. After being cleared of salt, rubbed with spices (a Bosnian dry rub is usually very simple, and includes some combination of high-quality fresh peppercorns, hot paprika, salt, onions & garlic, and sometimes with a few spoons of Vegeta, a popular powdered all-spice mix similar to an Oxo flavor cube), the meat is then hung over a heavy smoke made by a wood fire. Fruit trees are well-known by BBQ aficionados around the world to produce the most flavorful smoke and apple, cherry, and walnut trees are the most commonly used in Bosnia. Whereas commercially produced deli meats (of the sort you may buy at your local deli) are most often dry-cured or hung in dehydrating fridges and only then pressure-smoked for a few hours to allow some flavor to permeate the meat, Bosnian smoked meat is painstakingly smoked up to three months. The meat hangs in a "smoke house," a tiny wooden shed usually only big enough to light a fire and hang the meat. Bosnians will only smoke meat in the fall or winter, because the low temperatures, together with the salt curation, allow the meat to hang for months without spoiling. During this time, it is smoked up to 4 times a week, for 8-10 hours at a time, which infuses the meat with the flavor of the smoke and removes any remaining water. The finished product has an incredibly strong aroma and flavor of smoke, with the texture of chewy beef jerky. Depending on the cut of meat, the most noticeable difference between smoked meat produced this way and the commercially produced meat available in North America, is the color inside the meat. Whereas commercial deli meat is usually soft, red, a little wet and fairly raw, Bosnian smoked meat is black throughout with only a slight tinge of pink. Larger cuts of meat, like the Dalmatian prosciutto, do tend to be a bit more pink & softer inside, but the difference is still dramatic, since the Balkan-made prosciutto has much less water, is chewier and overall better smoked. Such meat is most often consumed at breakfast time, in sandwiches, or as meza, a snack platter of meats, cheeses, peppers, Ajvar, and other small bites commonly brought out to greet and welcome guests to one's home. For the visitor, smoked meats are a cheap and incredibly flavorful lunch meat, and can be bought at Bosnian marketplaces from people who usually prepare it themselves. Have a pork neck sandwich with some Bosnian smoked cheese and a salad of fresh tomatoes in a bun of fresh and crisp homemade bread, and you'll never want to leave. When you visit a Bosnian at home, the hospitality offered can be rather overwhelming. Coffee is almost always served with some home-made sweet, such as cookies or cakes, together with Meza. Meza is a large platter of arranged smoked meats, which usually includes some type of smoked meat (usually pork in traditional non-Muslim homes; Mulim homes usually prefer beef or lamb cuts), and sausage thinly cut and beautifully presented with cheese, ajvar, hard-boiled eggs and freshly cut tomatoes, cucumbers, or other vegetables. Bread is always served. Most cookbooks on South Slavonic cooking are packed with hundreds of varieties of breads, this being one of the most bread-crazy regions in the whole world. Yet, just about the only type of bread in most Bosnians' homes is the store-bought French variety, which the Bosnians, of course, would never dream of calling "French." 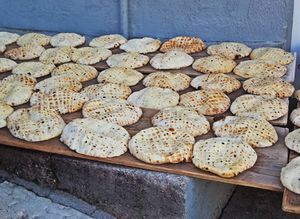 To them, it is simply bread - "Hljeb" or "Kruh". In every-day cooking, Bosnians eat lots of stew-type meals, like Kupus, a boiled cabbage dish; Sarma, a rolled and stuffed (usually with rice and ground beef) cabbage dish, slow cooked; Grah or Pasulj, beans prepared in a similar fashion; and a fairly-runny but equally delicious variation of a Hungarian goulash. All these dishes are typically made with garlic, onions, celery and carrots, followed by starchy vegetables, cuts of various meats, or smoked ones, and several cups of water. This is then cooked until the vegetables are tender. A regional all-spice mix called "Vegeta", which is widely used and available in most ex-YU countries, is incorporated into almost every dish. This spice is used throughout the region, and is available throughout Europe as far as Poland, but in other parts of the world. It is the North American equivalent of a chicken Oxo cube, or, in other words, condensed chicken broth mix, although Vegeta is completely vegetarian. These type of stew meals will cost you next to nothing, and are very hearty filling meals. The legal drinking age in Bosnia and Herzegovina is 18 years (changed in 2005). Popular domestic beers are Nektar (from Banja Luka), Sarajevsko, Preminger (from Bihać, made according to a Czech recipe) and Tuzlansko, while the most common imports are Ozujsko and Karlovacko from Croatia, Jelen from Serbia, and Laško and Union from Slovenia. Like in almost every European country, beer is very common and popular. Even in more heavily Islamic areas alcohol is available in abundance to those who choose to drink and almost every bar is fully stocked. Like most Slavs Bosnians make 'Rakija' which comes in many a variety and is made both commercially and at home. Red wine is 'Crno vino' (Black wine) and white wine is 'bijelo vino'. Wines from Herzegovina are renowned for their quality. Alcohol is not taxed as heavily as in most Western nations and is often very affordable. Quality alcohol is sought after and valued. In Banjaluka the best hotels are: Cezar, Palas, Bosna, Atina, Cubic and Talija. In Sarajevo the best hotels are: Bristol, Europe, Radon Plaza, Marriott (Courtyard and Residence Inn), City, Festival . With one of the highest unemployment rates in Europe (in some areas up to 40%, official rate 17%), it will be unlikely you will find legitimate employment in the country unless you are working for a multi-national organisation or working in Sarajevo where the unemployment rate is a bit lower compared to the rest of the country. The capital city is generally very friendly when it comes to expats, offering many possibilities for them. If you plan on traveling off the beaten path in Bosnia, be aware that the nation is still in the process of clearing many of the estimated 1 million land mines left around the countryside during the war of 1992-1995. In rural areas try to stay on paved areas if possible. Never touch any explosive device. Houses and private property were often rigged with mines as their owners fled during the war. If an area or property looks abandoned, stay away from it. Beside this, Bosnia and Herzegovina is a very safe country. Small towns do not face almost any serious crimes, but this is not the case with Sarajevo. Pickpocketing, reckless drivers, thefts and fights are becoming daily news from Sarajevo and some foreigners have been victims, too. Although the chances for you to be affected by this are small, be careful - small crimes have been on rise in recent years and it seems officials are not able to solve this growing problem in Sarajevo. The city is still much safer than many other capital cities in Europe, but reputation "the safest capital in Europe" is very questionable. Do not try to cross the street on the crosswalk and expect people to stop. Bosnians have very poor traffic culture and you might get hurt. WARNING: Be aware that serious flooding in 2014 shifted some land mines and also some notices marking unsafe or cleared areas. All tap water in Sarajevo is clean, pure and most definitely safe. However in other parts of Bosnia, especially the Posavina Region and Eastern Bosnia, drinking tap water is highly discouraged as it is the cause of illness. Boiled tap water is still not safe to drink. Most cities in these regions have tap areas (especially near hospitals) with clearly marked labels reading "Water for drinking". This water is safe to drink as well as bottled water you can buy in shops and from street vendors. Be aware of the harmful thick smog that blankets cities such as Sarajevo, Zenica, Tuzla, Brčko and Visoko. If you are an asthmatic or sensitive on the lungs, be sure to wear a medical mask as to avoid illness and wrecking your trip. Air pollution is caused by emissions from industry, motor vehicles and burning of rubbish, which is very common around the country. It is worst during the winter time in Sarajevo when soot covers the basin. It is recommended to escape to the mountains on bad days, and to breathe clean air found above the "smogbank". Smoking is allowed nearly everywhere in the country, and over half the population use tobacco. Therefore, be prepared to endure very smoky restaurants, bars and shopping centers. Even bus drivers often smoke while driving. Respect the religious differences of the people in the region and their effort to move past the Yugoslav war. It is important to be careful in areas where there is still tension and to ensure that one does not offend a particular group due to indifference or sheer ignorance. Don't mix up the terms "Bosnian" and "Bosniak". The former refers to all Bosnia's citizens regardless of ethnicity, the latter refers to a particular ethnic group. Also, while some people (generally non-Bosniaks) still refer to Bosniaks simply as "Muslims", many do not like this and it's inadvisable to use the term yourself. Do be aware that the two entities have their own separate postal services, so stamps bought in the Federation cannot be used in the RS and vice versa. There are three mobile phone networks in Bosnia and Herzegovina: BH Mobile (All of Bosnia and Hercegovina), HT ERONET (Mostar) and m:tel (Republika Srpska, Banja Luka). You can buy a prepaid SIM card from any network at any kiosk for 5 KM or less. The quickest way to recharge your prepaid phone or mobile broadband service is online which is available in multiple languages and works for all providers, or you can visit your nearest newsstand or kiosk.